Ocean Galleries kicked off the summer season with a collection of Brian Davis’ stunning floral paintings. His unique ability to capture light and detail on canvas was demonstated during the weekend long show in which Brian created a masterpeice and described each step of his painting Brian Davis Paintingprocess. Brian says, “The light is the real subject of my work. The flower is the stage, the light is the dancer “, as it is a rare ability for an artist to be able to capture the light the way he does in his artwork. With a Master’s attention to detail and an enormous passion, Davis transforms gorgeous roses, calla lilies, and dahlias into romantic, compelling images with sharpness, color, movement, edge, and light. His striking artwork has won the admiration of fans worldwide, with several original paintings in permanent collections at the prestigiorespledent queenus Huntington Library Art Collections and Botanical Gardens in San Marino, CA and the New York Botanical Garden in New York City, NY. Brian carries his camera everywhere so he can shoot a flower or landscape at any moment. Since flowers wilt so quickly, and it can take weeks to make a painting, the artist has found a way to create his floral image from a series of different shots for each flower. He may not do an exact botanical rendering, changing colors and leaves at will. Even during his short stay here in Stone Harbor, Brian spoke of his wish to capture the beautiful roses down the street from his hotel room that may now become one of his many masterpieces. Ocean Galleries is honored to have hosted Brian Davis and maintains a collection of his works in the galleries. 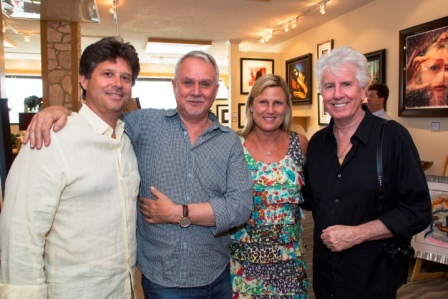 This summer Ocean Galleries was honored to host the first ever art exhibition by rock and roll hall of famer Graham Nash. People came from all parts of the country to see if the man that touched their hearts with his music would also touch their hearts with hisCrosby artwork. As a founding member of The Hollies, and Crosby Stills & Nash – a band that has been called, ” the voice of a generation,” Graham Nash has made his mark as a music legend. On June 28th Ocean Galleries offered the public a glimpse into another of Graham’s artistic passions with the debut of his never before seen artwork. Inspired by his father, he picked up a camera at age 11. Taking pictures of his family proved life changing for Nash who says, “That was the first time I realized that I could see things differently“. Though Graham eventually decided that music was his calling, he continued to capture fleeting moments thoughout his career with photographs, linemany of these moments becoming songs later on. His collection at Ocean Galleries included a variety of techniques including block print, pastels, and acyrlic, each piece more beautiful than the next. 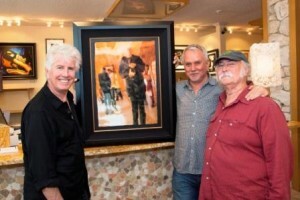 Graham Visited Ocean Galleries for the first time on July 1st to be a part of the excitement. As you can see above Nash’s good friend David Crosby also came to support him and enjoy the beautiful artwork for the first time. But Crosby was not the only one excited to see Graham’s work. 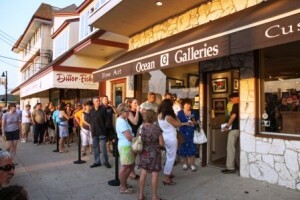 On the night of the opening Ocean Galleries had a line in front of the gallery of excited art lovers! Though it came as no surprise, his work was very well recieved by the public and Graham was busy the entire evening signing purchased paintings and posing for photographs. Below you can see the smiling faces of the new owner of Nash’s “Self Portrait Da Vinci“, originally taken with one of the first ever digital cameras. After Graham aquired his first Da Vinci camera he experimented by taking photographs of himself. He quickly discovered that the quality wasPurchased Da Vinci Self Portrait very poor and the image came out strangely pixelated. Where many would throw the picture away or just disregard it as a bad photo, Graham saw rare beauty and decided to enlarge the image up on canvas and paint it. Throughout his collection there are different variations of Da Vinci Self Portraits. 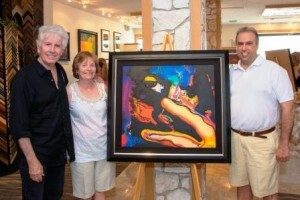 The artwork of Graham Nash represents the manifestation of his love for music and art over the past 50 years. 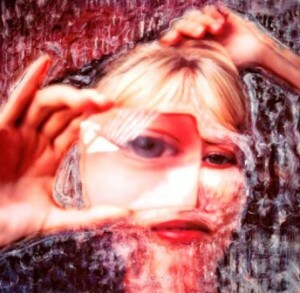 Some of his other work includes paintings and photographs of various band members as well as other singers such as Johnny Cash & Joni Mitchell. 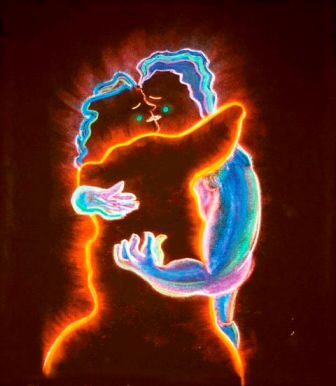 His works ranged from pieces with powerfull political undertones to lighter works such as, “Charlie” a drawing of Graham’s crazy but interesting friend and also some very personal artworks like “The Kiss” an intimate moment between Graham and his wife Susan. Ocean Galleries is proud to have hosted a historic event of this magnitude! The show will continue until the end of July. On August Third, Ocean Galleries presented its final and perhaps most unique event of the season featuring 10 year old Autumn De Forest. Referred to by the Discovery Channel as, “an artistic genius”, Autumn creates paintings ranging in style from beautiful landscapes, to Warhol inspired “pop” art. 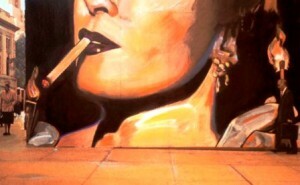 Not only were people amazed by her artistic talents but hearts were softend by her compassion. Autumn says, “I had been through my toddler phase, so I wanted to do something to help the world – to change the world; so I thought, how about painting?”, Autumns paintings have given her the chance to travel the country speaking on the importance of arts in education; Harvard University recently invited her to speak on the subject. Her charitable and humanitarian support also includes relief efforts in Haiti and Japan. The young artist’s pieces grace collections worldwide. Autumn was the youngest artist ever featured at the National Art Education Association’s annual convention, where she appeared along with art world legends such as Peter Max and Chuck Close. Matt Lauer interviewed Autumn on the Today Show, The Discovery Channel profiled her as a child genius, and many other television programs featured the young talent, including Inside Edition, ABC,CBS, FOX, and NBCNews. American Girl Magazine, Parenting, and Huffington Post are just a few of the publications that have spotlighted Autumn. But despite her fame and her unique talents, anyone that has met her will agree that she is just a sweet as can be! During the show Autumn was interacting with children of all ages as you can see on the left, as well as bringing out the inner child within all of us. It was an honor to have hosted such an inspiring young lady for her first ever one person show.